Brandenberry Furniture is celebrating the end of 2018 with a Big Amish Furniture Blowout Sales event. Office furniture, dining room furniture, bedroom furniture and living room furniture are all on sale! Save 15% on every item on the Brandenberry Furniture showroom floor. Many items are discounted higher than 15% and some clearance showroom models are up to 65% off. The Big Amish Furniture Blowout Sales event takes place December 26th through December 31, 2018 at Brandenberry Amish Furniture in Shipshewana, Indiana. 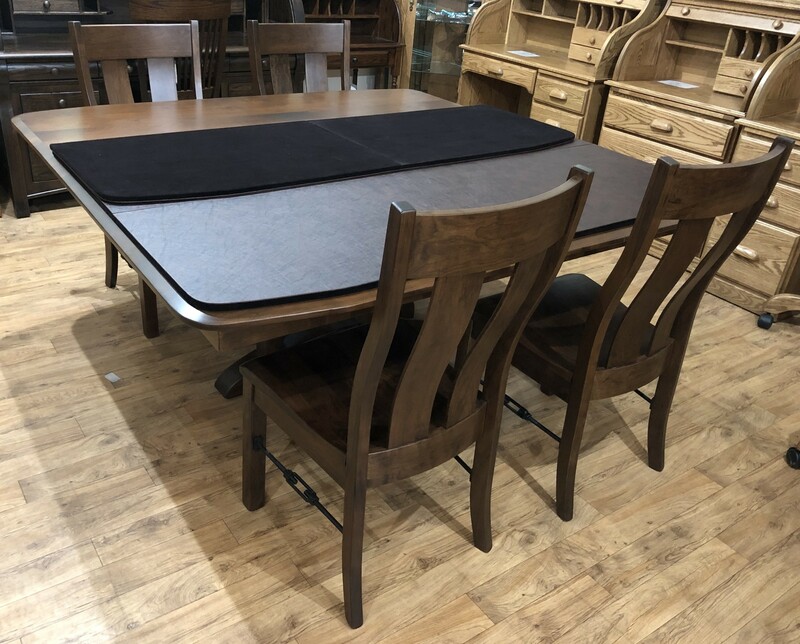 Brandenberry Square Meeting Table – Come and see the markdown on this solid wood table, chairs and table pad! If you have been waiting to buy Amish Furniture consider driving to Shipshewana the day after Christmas. Enjoy some incredible food at a local restaurant or donut shop and then stop by the Brandenberry store. With all of the solid, wood handcrafted Amish furniture pieces discounted, you will find a piece or two that will look beautiful in your home or office. Be sure to bring some blankets and a vehicle with space (or even a trailer) and the staff at Brandenberry Amish Furniture will help you load the furniture that meets your style and decor needs. The Big Amish Furniture Blowout Sales event will save you money! Brandenberry’s Big Amish Furniture Blowout Sales Event happens only once a year! You will find dining sets discounted more than any other sale during the year. Will you need a new tv stand to house all of your tv or gaming equipment that you received on Christmas Day? Stop by and check out the tv stands and cabinets built by highly skilled Amish craftsmen. Have you been waiting to upgrade your bedroom furniture? Brandenberry offers full bedroom collections including cheval mirrors, blanket chests, jewelry cabinets and dressing tables that match the bed, nightstand, dresser and chests. Be sure to visit Brandenberry Furniture right after Christmas Day to see all of the specials on display. Brandenberry Amish Furniture is located at 1045 N. State Road 5 in Shipshewana. It’s at the intersection of State Road 5 and US 20, near the Indiana Toll Road. The store is open Monday through Saturday from 9 a.m. to 5 p.m. and by appointment. Brandenberry Furniture opened its doors in 2008. The Brandenberry Furniture concept allows customers to design the furniture of their dreams. Including to explore the rich woods and stains that only nature can offer. Nothing matches the feel, the smell and the weight of hickory, oak, cherry and maple. And these real woods come to life in an Amish handcrafted piece. Also, the pieces are meant to last a lifetime and beyond. Is your favorite style Mission, Traditional, Modern or something in between? If Brandenberry Furniture doesn’t carry it, our craftsmen will build it to your specifications. At Brandenberry Furniture, we offer everything from bedroom and dining collections to home accessories. Also patio and exclusive furniture pieces. So browse our easy-to-use website. It contains detailed photographs and information. Also, you’ll find furniture categorized by room. These include family room, dining room, bedroom, office and children’s furniture. What’s more, you’ll find furniture categorized by style and wood species. These species include oak, hickory, cherry, elm, maple, pine and cedar.